If you're on the hunt for a casual yet sharp look, wear a Mossimo supply co pullover crew neck sweater navy fair isle with burgundy chinos. These two pieces are very comfortable and will look great paired together. 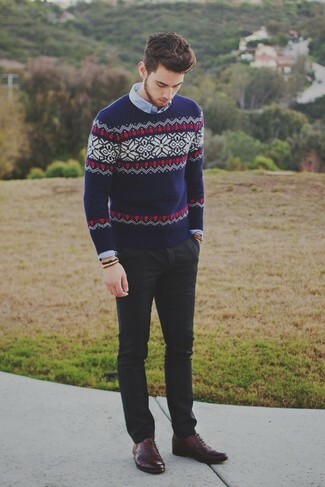 If you're scouting for a casual yet sharp outfit, consider teaming a Mossimo supply co pullover crew neck sweater navy fair isle from Target with black chinos. These garments are very comfy and look great paired together. Add burgundy leather oxford shoes to your ensemble for an instant style upgrade. 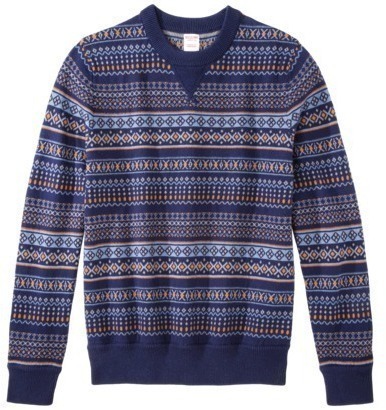 If you're on the hunt for a casual yet seriously stylish getup, pair a Mossimo supply co pullover crew neck sweater navy fair isle with blue jeans. These two items are totally comfortable and will look incredible paired together. To add elegance to your ensemble, round off with brown suede casual boots. If you're on the hunt for a casual yet stylish ensemble, team a Mossimo supply co pullover crew neck sweater navy fair isle with dark brown chinos. These two pieces are totally comfortable and will look great when worn together. 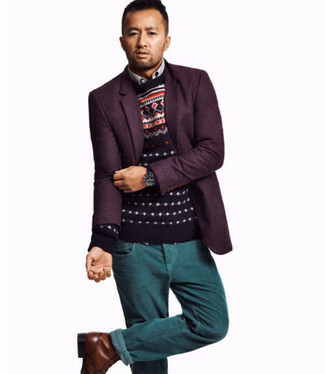 Kick up the cool of your ensemble by rounding it off with brown suede desert boots. If you're hunting for a casual yet on-trend ensemble, wear a Mossimo supply co pullover crew neck sweater navy fair isle and navy jeans. These items are very comfortable and look great when paired together. 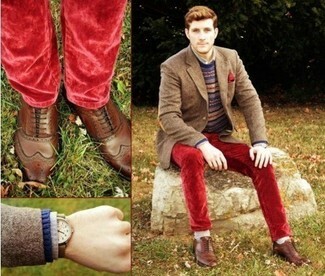 Let's make a bit more effort now and throw in a pair of dark brown leather desert boots. If you're on the lookout for a casual yet seriously stylish look, reach for a Mossimo supply co pullover crew neck sweater navy fair isle and aquamarine jeans. These garments are totally comfortable and look great paired together. Amp up the cool of your ensemble by finishing off with brown leather casual boots. 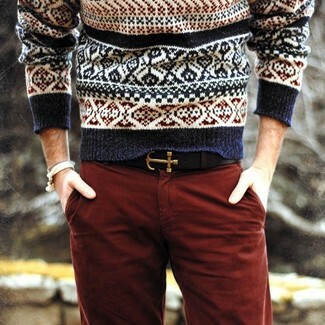 If you're on the lookout for a casual yet stylish getup, wear a navy fair isle crew-neck sweater and red velvet jeans. Both pieces are totally comfy and look great when paired together. You could perhaps get a little creative when it comes to footwear and dress up your outfit with dark brown leather brogues. If you're on the lookout for a casual yet stylish outfit, pair a navy fair isle crew-neck sweater with navy jeans. Both pieces are super comfortable and will look incredible together. Perk up your ensemble with dark brown leather casual boots. 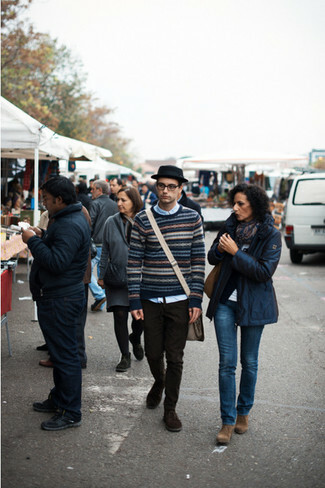 Consider wearing a Mossimo supply co pullover crew neck sweater navy fair isle and charcoal dress pants to ooze class and sophistication. Add a glam twist to your ensemble with dark brown leather oxford shoes.